TOSOR PASS, KYRGYZSTAN — Was up early this morning to get a jump on the road. 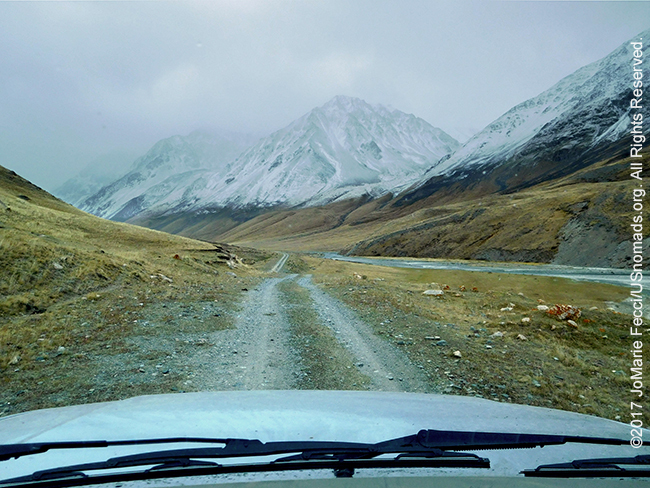 The Tosor Pass route is unpredictable and can take anywhere from 6-12 hours to drive depending on conditions. From the start I was a bit concerned as it was drizzling and I was unsure what that could mean for the mountains. I was worried about slick mud on steep rocky trails, but the “rain” was not heavy at all, and it would be too bad to miss out on this “highlight” of the overlanding journey due to a few drops of rain. I set out to go ahead with the planned trail, determined to keep an eye on the weather situation and be prepared to turnback if the terrain started to get too muddy. I was on the road at the first hint of light, while the deep blue color of the pre-dawn hours still washed across the landscape. The rain stopped as the sun struggled to appear between the clouds and as I turned off the main road into the Naryn Gorge it was magnificent and beautiful in a rugged and wild way. A rickety bridge crossing over the raging river below gave pause, but I drove it carefully and continued following the route of the river. Approaching the mountains, the road narrowed and began to climb, twisting up and around. It got a little bit rockier, and the sky was grey and it was misting, but not exactly raining. I was concerned about slippery mud on the steep curves and moved carefully. I couldn’t go too slowly though as I had to keep up a fairly brisk pace in order to make it to Lake Issy Kul in daylight. After some twisting and turning, the mountains opened up on a beautiful valley and I was tempted to stop for lunch. The next leg of the day’s journey was on a smaller road that climbed up into another section of mountains and valleys. Here I drove along in the valley following tracks that sometimes veered off the “road” to bypass places where the “road” was washed out or blocked by rock-spill from the mountains. There were numerous small water crossings as the route zig-zagged along the path of streams running down the mountains towards the river. A few rickety bridges spanned some of the larger sections of running water. In other spots the “trail” was not very clear as it was interrupted by a bed of rocks that were easy enough to pick a line over, but it was more difficult to see where the trail picked up on the other side. The weather was turbulent, changing from mist to rain back to mist. However, despite the precipitation the “road” seemed fine and I was making good progress vis-a-vis the time when I arrived at a small building by the base of another mountain. This was the “last” shelter before the Tosor pass, and I had been told it was the final “turnaround” point if I needed to turn back. Looking at the weather I was still a bit concerned, but I could see from the map that I was almost to the pass itself, and from there it would be a downhill drive. The rain was occasional and not heavy, though there had been a few flakes of snow. And while it was cold and damp, there seemed to be no real reason to turn back at this point. Committed to going ahead, I began the route upwards which soon enough brought me to yet another plateau where herds of horses ran freely in the rugged wilderness. I wished the weather was better as I would have liked to spend more time photographing. Though with the time pressure, I probably was better off to keep driving. The “road” here was rough in spots, with a bit more rock, but still easy enough to drive in 2-wheel drive most of the way. I had only been using 4-Hi when there was a more difficult patch in order to conserve fuel and hadn’t had to use 4-Lo at all. Passing a few herders in the distance I made note also of a yurt, which was the only sign of any habitation at all. It was getting colder and the wind had picked up. The rain was now mixing with a bit of snow, but nothing was sticking to the ground and I was getting close to the mountain tops. There were snow caps on some of them and it was beautiful in a rugged way. I continued the climb and soon there were no more animals and the route got steeper again. The map said I had only a few switchbacks to go to make it to the top, and it was around 3pm, so I had plenty of daylight left. I was looking forward to arriving to the lake in time for sunset (though with the overcast skies I wasn’t sure there would be much of a sunset to speak of). Feeling good about the journey, I turned for the switchback, and suddenly the route ahead was covered with a light dusting of snow making it more difficult to see where the actual “road” was. I concentrated on the terrain ahead and was able to make out the hints of a route under the white coating. Following it carefully I saw the “turn” and began the next leg up and halfway along my tires started to spin and forward movement stopped. 4-Lo would not engage and 4-Hi was not enough to get forward motion. I had no Maxtrax, so I pulled out the floor mats and placed them under the tires for traction. This, combined with 4-Hi was enough to get moving again, but only for about another hundred feet. The scenario repeated, but this time even the mats weren’t enough to move further than twenty feet or so. It was impossible to get the necessary momentum mid-switchback. I would have to back down and try again. After a few more futile attempts with more spinning tires, stucks with snow-covered rocks chocking my wheels unexpectedly, and no real progress forward, a flat tire halted the operation. A missing jack part complicated the situation even further, and with sub-zero temperatures and nightfall coming soon I had to call for assistance. Then I had to shelter in place until the recovery team arrived. Luckily I had brought emergency equipment including survival blankets and lots of cold weather gear.